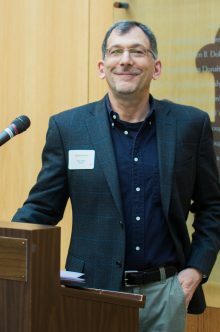 Matt Berg’s teaching responsibilities include courses in modern German history, the holocaust, conflict in the 20th century, and genocide and human rights. His research focuses on society and politics in Austria after the Second World War. He is the author of a range of articles treating postwar Austrian political culture, and has edited several volumes, including The Struggle for a Democratic Austria: Bruno Kreisky on Peace and Social Justice (Berghahn, 2000) with Oliver Rathkolb and Jill Lewis, After Fascism: European Case Studies in Politics, Society, and Identity Since 1945 (Lit Verlag, 2009) with Maria Mesner, and Narrating the City: History, Space, and the Everyday (Berghahn, 2015) with Wladimir Fischer-Nebmaier and Anastasia Christou. His current project is a monograph tentatively titled Renewing Red Vienna: The Reconstruction of a Social Democratic Milieu, 1945-1949, a study of the relationship between efforts of municipal administrators to rebuild the war-torn capital and the everyday concerns of Viennese residents.